The Regensburg Baskets may not have started their 2012 with a victory, but they were satisfied with their 87-78 home loss against league leaders BBC Bayreuth II. “I am very satisfied. We were able to do everything we wanted – play tough, defend well, and keep close as long as possible,” said Regensburg coach Markus Höß about the game Sunday. Regensburg captain Johannes Wießnet was also satisfied with how the promoted team played at the Königswiesen Halle gym – especially after finishing 2011 with four straight losses, including a bitter defeat at last placed BBV Leipzig. The Regensburg Baskets haven’t played competitive contest since the December 11 loss at Leipzig. But they had a strong showing against Bayreuth, who lead the 2. Regionalliga SouthEast standings with a 10-1 record. Regensburg are second to last as one of four teams with a 3-8 record. “You could see that things are getting better. In general, the game flowed much better. We made relatively few errors. If we can maintain this level – also against the ‘weaker’ teams – then it will be okay. We have to make sure now that we continue to play like this,” added Höß. Bayreuth jumped out to a 15-8 advantage thanks to two three-pointers by Lukas Edler. And the guests led 25-18 after one quarter. Bayreuth increased the cushion to nine points a few times in the second quarter and went into the half ahead 41-36. Regensburg fought back to within 45-42 but Peter Zeis nailed two three-pointers in a 12-3 Bayreuth surge which pushed the lead to 57-45. Regensburg came back one more time and trailed just 57-53, but Bayreuth’s 45-year-old veteran center Nils Becker made two late baskets – the second a three-pointer coming just before the third quarter buzzer for a 62-53 lead. Bayreuth scored the first four points of the fourth quarter and Regensburg could not get closer than nine points the rest of the way. Becker tallied eight points in the period and Bayreuth hit seven of eight free throws in the final 56 seconds to ice the victory. Regensburg’s center Wießnet – 24 years younger than Becker – led the Baskets with 23 points while Daniel Waldhauser tallied 14 points and Tobias Waldhauser hit for 12 points. Jonas Schneider chipped in 11 points in the losing effort. Coach Höß has been impressed with how the Waldhauser brothers have found their way into the team despite only joining the club in December. “Both of the ‘new guys’ were much better integrated. You could really see that,” said Höß of the Waldhauser brothers. Zeis led all scorers with 24 points including four three-pointers while Becker finished with 15 points. 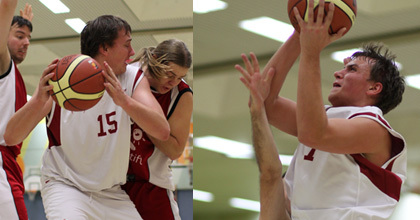 Edler and Jonas Riesner both scored 13 points for Bayreuth. Regensburg’s next game is Saturday January 21 at home against TG Würzburg.